Only time will tell whether GAP’s February 20 decision to voluntarily raise its minimum wage was, in the end, a good move on the reputation and CSR fronts, a way to tell investors that the company is thinking five steps ahead, or a well-meaning but ultimately insignificant gesture. For what it’s worth, the move did inspire a visit today from President Obama, who happened to be in the city to do the one thing all incumbent politicians do well: raise money. Of course, the fact that the President stopped into a clothing store in midtown Manhattan (but NOT to buy a pair of those famously geeky khakis) is the very furthest thing from “real news”. The reason he chose this particular store, however, is worth noting from a corporate comms perspective. 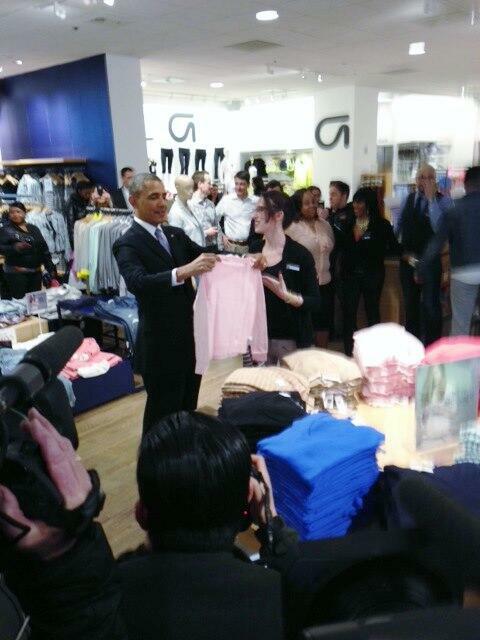 So yes, it was an opportunity for members of the White House press pool to take pictures of Obama browsing the selection at the GAP. As far as the value this earned media exposure will have for the brand, we’ll just say that’s a lot of headlines. Unfortunately, Zach Galifianakis wasn’t around to play good cop/bad interviewer, so we have no one-liners about turkeys or birth certificates to share with you at the moment.